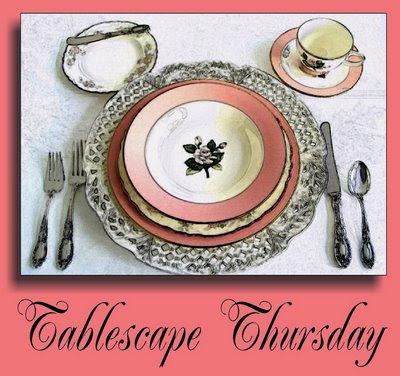 Some Days Are Diamonds: My very first Tablescape Thursday! Now, we'll see if I'm smart enough to do everything else that is necessary to participate in this. OK! I think I did it! Thank you so much to Susan at Between Naps on the Porch for hosting this. I have long admired her blog and just had to participate this time! I'm so excited! Here we go! My Tablescape. The last one of "Spring". Because when I come back from wine tasting in Paso Robles this weekend, (where it is supposed to be 96 degrees UGH!) , I'll be in "Summer mode"
My very last "Spring" table setting. I love these dishes. But . . . they are very seasonal. I love these dishes! TJ Maxx! About 5 years ago. Even the hand painted glasses! They are so cheerful. I leave them out 24 x 7 since the first day of Spring. And yes! We really do use them! They make me smile! they were on clearance - had to have them!! They went so perfectly with my dishes! the colors . . . the weight of each piece. TWO WEEKS AGO! I love Carnations. And that Dear Friends - is my very first Tablescape Thursday! I'm off to Paso Robles Wine Fest and will be back on Monday to share the entire event with you! Have a good weekend everyone! ( I hope this posts correctly!) A computer person I am NOT! Very pretty table...have a good weekend. We are off to Colorado to see Dallas and family. LOVE the plates... looks FAB! Beautiful! I would like to sit at that table. It would be hard for me to put those away, can't wait to see what you put in their place. Have a great weekend and be careful on your journey! Wow Karen, what a wonderful first TT! I instantly spotted your chargers, because they coordinate with my dinner plates-I had no idea a charger exsisted! They are beautiful! WOW...the green charger is fantastic and I love the color too! My favorite is actually the glass topped table! Love it! Everything is so pretty; love the dishes from TJ. You look like a tablescape pro with this table scape. Thank you for joining us and sharing your dishes and ideas. Oh I love these plates! I need to stop by TJ Max when I get a chance! Very, Very Pretty! Love those chargers! I think that these dishes also say SUMMER! Hi Karen, and welcome to all the fun! Your table is beautiful. Yes those dishes are springy and lovely. You found a real treasure there! Don't you love all this fun? Well have fun today I know you will! Great job Karen!!! I love those chargers! Pasa Robles have great wineries..enjoy! Oh how pretty! I love your "spring" dishes, and your colorful and fun table!!! You did good, Karen!!! The plates are so pretty, and I really like those chargers. They are unique. I am too terrified to join in the tablescape, so far. I give you a lot of credit for being so brave. The weekend trip sounds like so much fun. Have a great time, and a safe trip. Hey Karen, I just had to come back...I KNEW those chargers matched!!! I got my dinner plate and appetizer plates @ Target last spring. If you want to pick up the Gibson dinnerware, you'll have to go to Big Lots. The pattern is called "Claremont" Although I have seen the same pattern @ Macy's for an astounding 100.00 the ones at Big Lots are only 35.00. Believe me you'll want the set even if you have dinnerware galore! Thanks for your happy comment and for following! I love your tablerunner and dishes. It all comes together and looks so colorful and I love color on tables! Hey Ms. Karen! Love your very first Tablescape! Love the floral theme and it looks so pretty! I'm in love with those green chargers! The handpainted glasses are precious with those colors matching the colors in the plates! Ciao for now! ~CC Catherine ;) Enjoy your fun weekend! Great job Karen! I just love your beautiful dishes! I too would keep them out 24/7 thru spring! Those chargers are just gorgeous!! What a find! Have fun in Paso Robles! Happy 1st Tablescape Thursday! A very pretty tablesetting.....very inviting. What a pretty table. I really love your chargers! Great floral centerpiece, too! Welcome to TT - Love those dishes -- You did well! Karen!!! Great job... You did it. And it's darling!! I think I will try my hand at this next time too. What a gorgeous tablescape! How could I have missed this!! You gave some wonderful advice to Allidink! I did the same and then noticed your comments..we are ON the SAME page! I need to get mine redone! Since I moved I have not done it and I stand to lose a lot..unless it is the BIG one...then...doubt anything would help! Your blog is lovely!! Just beautiful! I am so glad I came by!